This naturally balanced blend is made from organically grown whole foods and super-foods. It is specifically formulated to supply you with natural foods sources of vitamins, minerals, enzymes, and essential trace nutrients. The ingredients are from the finest organic and wildcrafted sources available. As you seek to increase energy, vitality, lose weight or build better health, use this powerful, natural superfood to support your efforts. 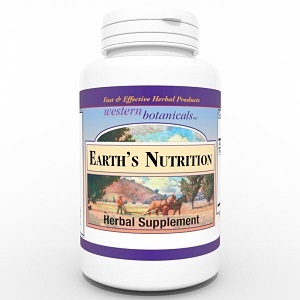 Earth's Nutrition is made up of only natural and healthy ingredients. It includes wheat grass, spinach leaf, orange peel, alfalfa leaf, lemon peel, and numerous other all natural ingredients to add to your healthy lifestyle. Add a boost to your daily nutrition with Earth's Nutrition to make sure that you receive a healthy balance of vitamins and minerals in addition to your normal dietary intake. Spirulina Blue-Green Algae, Chlorella broken cell Algae, Nettle leaf, Purple Dulse leaf, Wheat grass, Spinach leaf, Alfalfa grass, Barley grass, Astragalus root, Rose hips, Orange peel, Lemon peel, Beet root, Non-Active Nutritional Yeast. Take three to five capsules of Earth's Nutrition three times daily.